There’s no shortage of computer makers that would like to sell you a big, expensive gaming laptop. So in an effort to differentiate themselves, companies are thinking of ways to make a portable screen attached to a keyboard and some silicon inside seem more attractive. Asus latched onto Nvidia’s new Max Q design program for its new Zephyrus gaming laptop and crammed top-of-the-line specs into previously unheard of thin-and-light body. Meanwhile, Acer’s Predator 21x stretches the very definition of a laptop (and your wallet) by packing pretty much anything the company could think of into an absolutely monstrous body. 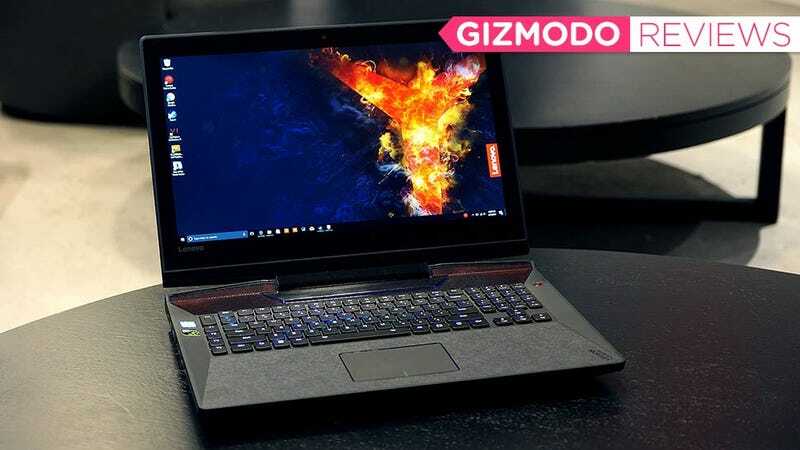 Lenovo is taking a different, and unfortunately, slightly more sedate path with its flagship Legion Y920 gaming laptop—this laptop looks like one made by everyone else, and for Lenovo, which is known for some really out there and often stunning design choices, this is an uninspiring take. A 17-inch gaming laptop with a mechanical keyboard. The speakers and the RGB lighting. The price, and no 1080 GPU option. But it’s not, precisely, a bad laptop. It has a standard 17-inch body with an Intel Core i7 HK processor, Nvidia 1070 graphics, 16GB of RAM and a pair of storage drives (one HDD, one SSD). Lenovo spices things up with surprisingly powerful JBL speakers with a dedicated 3-watt subwoofer, a Full HD display with Nvidia G-sync support and just enough RGB lighting to keep you from falling asleep during late night gaming marathons. Lenovo even went so far as to create its own low-profile mechanical keyboard, which is pretty ambitious (and par for course for Lenovo). There’s just one problem: I don’t think Lenovo totally nailed dat clack. The keys on the Y920 feel noticeably stiffer than your average laptop and their actuation isn’t totally smooth either, which leaves you with an experience that feels a bit chunky. At the bottom of stroke, you still get a meaty click, but my actual favorite thing about the keyboard is the ripple setting for the keyboard’s backlighting that causes colors to radiate out from the last key you pressed. And thanks to the way Lenovo put independent RGB lights behind every key and the thin translucent strips around the touchpad and behind the keyboard, you can can make the whole system light up like a disco ball if you want. 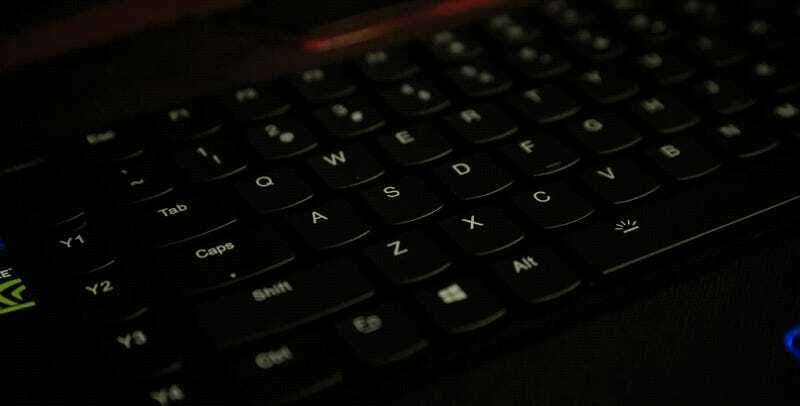 But this isn’t a feature unique to Lenovo’s keyboard. Instead its another example of Lenovo failing to really distinguish its flagship gaming rig. Pretty colored lights aside, the Y920 features a very basic (and at 10.1 pounds, heavy) design. The chassis is mostly plastic, aside from its brushed metal lid and faux leather wrist-rests. It isn’t an offensive combination, but it’s not very memorable either. 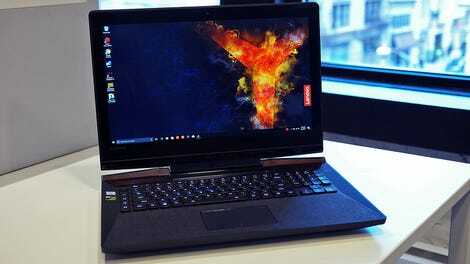 Lenovo’s premium Yoga laptop line has signature watchband hinge, while the ThinkPad series has that loveable little red dot. The Legion feels tame, it’s missing its own trademark flair. I think it would do Lenovo some good to move away from the overused black-and-red color scheme that every other gaming laptop makers seems to abuse and try something else. But at least what the Y920 lacks in style, is made up for in utility, thanks to a healthy selection of ports include four USB 3 Type-A, one USB-C port with Thunderbolt 3, HDMI, DisplayPort, Ethernet and pretty much anything else you might ever need. Lenovo even smartly put all the ports you’d need to hook up a Vive or Rift on the same side, so you won’t have to drape cords around the laptop like some kind of techy spider’s web. But even though the utility is great, it’s hard to get super excited about ports. And it’s hard to get excited about the (still really good) performance. In Rise of the Tomb Raider, the Y920 pumped out 100 fps maxed out on very high at 1920 x 1080. And in PlayerUnknown’s Battlegrounds, which is pretty much the only game anyone plays nowadays, the Y920 hovered around 70 fps on Ultra. This gives it enough headroom to stay above 60 fps almost all the time, and for times like intense firefights when things dipped below 60, the Y920’s G-sync-enabled helps make gameplay look as smooth as possible. Really, my biggest gripe, beyond a boring design, is actually something you can’t get on the Legion Y920: Nvidia 1080 graphics. Not having the option of configuring the Y920 with the best GPU currently available seems like a weird omissions for what is supposed to be Lenovo’s flagship gaming laptop. There’s also Y920’s price to consider. Currently, it’s listed at $2,699 on Lenovo.com, which is way too high. Some other folks claim to have seen third-party retailers list the Y920 around $2,400, but I’ve had no such luck. And even if you could, that’s still about the same as a top-of-the-line Alienware 17, which has similar specs and a more powerful Nvidia 1080 GPU. A high price and a yawn-worthy design had me wary of the Y920. Then things got worse when MSI’s GT75VR Pro arrived halfway through my testing period. That’s because even though the GT75VR’s starting price of $3,300 puts it an an even loftier bracket, MSI’s massive gaming laptop, like the Y920, also has its own low-profile mechanical keyboard, which was developed in partnership with SteelSeries. And critically, unlike the Y920’s keyboard, it actually delivers smooth stroke and that clicky, tactile feel I was looking for when I first heard companies were putting low-profile mechanical keyboards on laptops. The Y920 just doesn’t feel as cool in comparison. But there’s definitely potential. Lenovo, you are one of the the biggest laptop makers in the world. Put some fire and passion into this thing, and make your flagship gaming laptop stand up to the nutty systems other notebook makers are whipping up, and save the sensibility for the more affordable stuff. A lackluster design and a pretty, but ultimately just OK keyboard aren’t enough, especially for $2,700. The Y920’s G-Sync screen makes games look smoother when your fps dip under 60. It has all the ports you’ll ever need, even if you want to hook up a VR headset like a Rift or Vive. This thing weighs 10.1 pounds, so don’t plan on moving this around very often. Lenovo created its own proprietary low-profile mechanical keys and then put RGB backlights behind every one. The stereo speakers and 3-watt subwoofer have a definite kick.